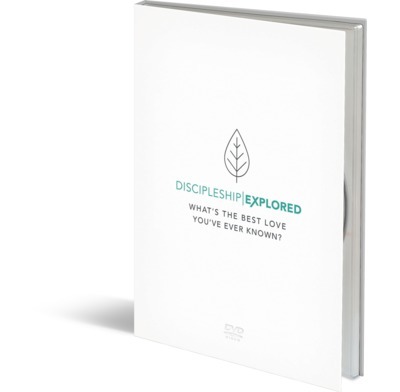 Brand new DVD to accompany the Discipleship Explored course. This eight-session journey through Paul's letter to the Philippians will help believers young and old to discover the greatest love anyone could ever know, and how to live as disciples of Christ Jesus today. This brand new DVD, shot on location around the world, contains a talk for each of the eight sessions as well as trailers and subtitles for the hard of hearing. Each film also has interviews with Christians from around the world, including those who have been persecuted for their faith. We should watch the "Righteousness in Christ" episode at least once a year because it encapsulates the truth of justification so well and applies it so powerfully. The quality of the content is matched by the quality of presentation in this amazing series. Been using this with new Christians in Hull, and it has been great for focussing them on Christ, walking them through Philippians and getting them into reading the Bible for themselves. New videos combine great visuals and talks that home in on main point of passage and really help the discussion and Bible study afterwards. We'll use it again and I highly recommend it. Growing in our relationship with Christ is the heart of Discipleship Explored. DE is a wonderful way to study Philippians in depth but it is much more too. To be "in Christ Jesus" means to know him more intimately and deeply as Lord, Saviour and King. Through the eyes and pen of Paul we are party to this intimate love letter written to the church in Philippi. Over 8 weeks we explore what it means to follow Jesus. How our joy, righteousness, contentment and sufficiency is all found in Him. Barry Cooper, who presents each episode, is such an empathetic and authentic guide - he reveals more about himself personally and how Christ has changed him than in the previous version of DE and this adds greatly to its effectiveness. The quality of the films is consistent with what the Netflix generation expects. The subjects all over the world who are interviewed over the 8 weeks feel like friends by the end and their heartfelt commitment to Jesus and his transforming grace shines through. It is a great programme as a follow on to Christianity Explored or Life Explored or as a standalone course for people who have already committed themselves to Christ. Our church's twelve Sunday evening small groups just completed Discipleship Explored as our fall study. In the 2+ years of small groups, I've received more positive feedback from this one than any other. I ws often moved to tears as I previewed the material. Rich biblical content, thoughtful applied theology, moving interviews with brothers and sisters around the globe, and visually breathtaking. The followup questions in the handbook are fantastic, although we rarely covered all of them due to the discussion that each session's message inspired. I highly recommend this study. It has set the bar very high for whatever studies will follow. Excellent DVD that does a good job of enabling us to engage deeply with the story of Philippians. Production values of booklets not quite so high but content is clear, thoroughly true to the text, and a helpful guide. Thank you! The discipleship material is excellent and complimented our study of fruits of the Spirit. I had used the previous discipleship explored series and this outstrips it by miles. The presentations are warm, incisive and really inspired. The focus on the video comes up in lots of good ways in the study afterwards, and the whole series is really well packaged and appropriate. No Bible study should be used right out of the box without some prayerful preparation, but I think this comes as close to that as I've found. I've loved using it and have no hesitation in recommending it. We have just been through this together as a church. I particularly appreciated how faithful it is to the text, how consistently Christ-centered is it, and how accessible and relevant it is to daily life. Questions arose every week that had us thinking how to honour Jesus more in our lives. I would highly recommend it. People tend to think of Discipleship Explored as simply a follow up to Christianity Explored, but its most recent revision makes it far more versatile than that. We used the new DE course with a small group of men with a range of Christian maturity. All of them benefitted from studying Philippians together and sharing insights into the text with one another. The updated DVDs are incredibly well produced, with a diversity of global voices included in the conversation, making them helpful for provoking helpful conversation even beyond a white middle class context. Not everyone will stick to the homework as perhaps they do for Christianity Explored, but its a nice option for those who are being encouraged to read the bible regularly for perhaps the first time. An amazing cinematic experience, with incredible production values. DE is perfect for those commencing their Journey of Faith, or for those looking for a burst of encouragement and motivation. Barry Cooper is inspiring. Can not speak highly enough of DE .